Home / Turntables / THIXAR Silence Plus Platform Turntable Isolation. Ultimate. THIXAR Silence Plus Platform Turntable Isolation. Ultimate. 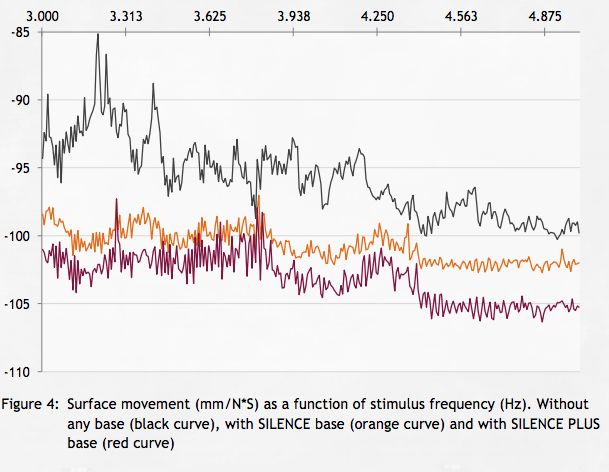 Thixar Silence Plus Turntable Isolation. Hands Down the Ultimate Turntable Isolation Platform. The already legendary top-of-the range product in the Thixar line of passive hifi equipment stands, the Silence Plus, has been further upgraded during the last year. With the gel support being used in a quite different form, Thixar could create an entirely new design. The upper support surface now fully rests on the gel without any impediments, meaning that it is no longer possible for any vibration at all to get through to the top. Thanks to the perfect connection of the gel core, the surface on which the equipment stands is even more effectively damped. Additional materials have been incorporated into the gel core by means of specially developed techniques in order to effectively eliminate specific frequencies. The flexibility of the gel is combined with other components in such a way that the degree of decoupling is enormously improved, preventing annoying interference even better. The SILENCE platform employs the gel as a flexible bearing across the full contact surface between the two parts of the equipment platform.